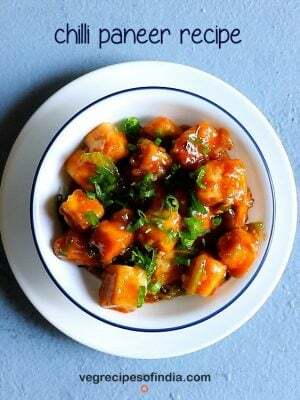 khatta meetha kaddu recipe with step by step photos – this sweet sour pumpkin is one of the easiest sabzi recipe that is made with kaddu or pumpkin. in hindi khatta means sour and meetha mean sweet. the sourness coming from dry mango powder and the sweetness coming from sugar/jaggery as well as pumpkin. 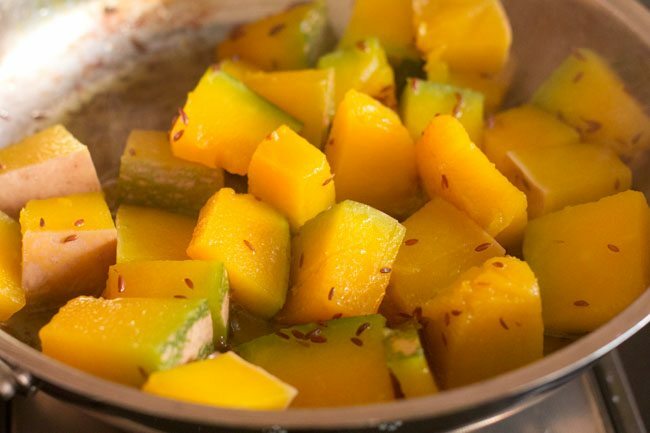 in religious fasting recipes, some communities use dry mango powder and some don’t. 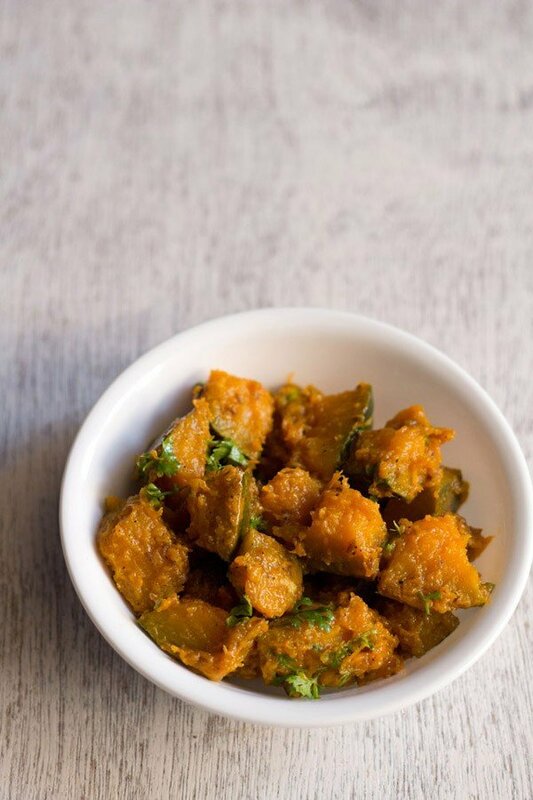 if you don’t use dry mango powder or amchur during the navratri fasts, then add tamarind pulp or lemon juice instead. the fasting rules varies from community to community. its always better to check with elders while trying new recipes for religious fasting days. 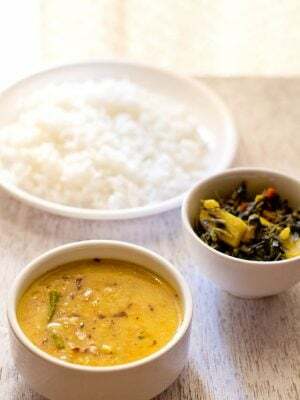 for readers benefit, i have made this list of navratri food rules which covers the list of ingredients commonly used for fasting in india. 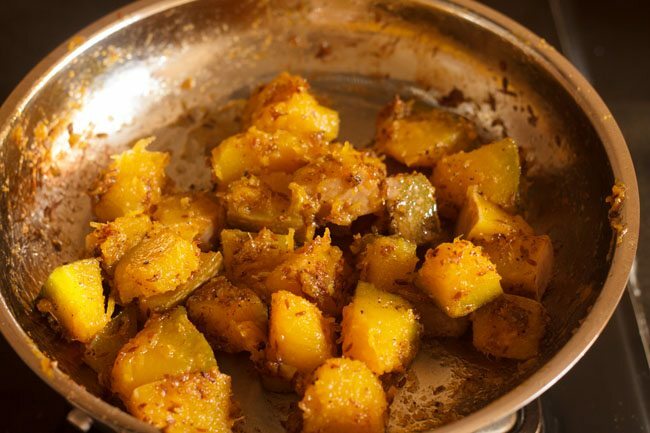 i have also made this khatta meetha kaddu recipe with dry mango powder or amchur, since we were fasting. 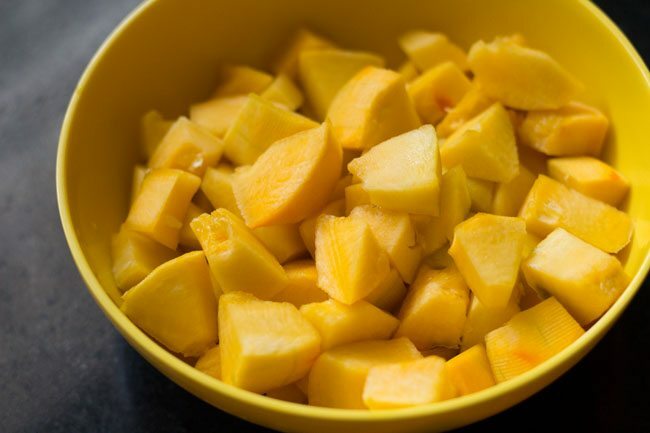 but the sourness is more pronounced with tamarind pulp, than with mango powder. 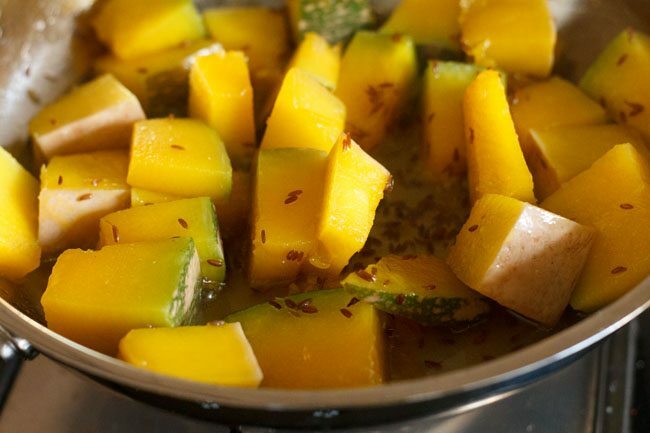 this pumpkin dish has to be balanced with the right notes of sweetness and sourness. so keeping on adding few teaspoons of the tamarind pulp till you get the right balance in the dish. 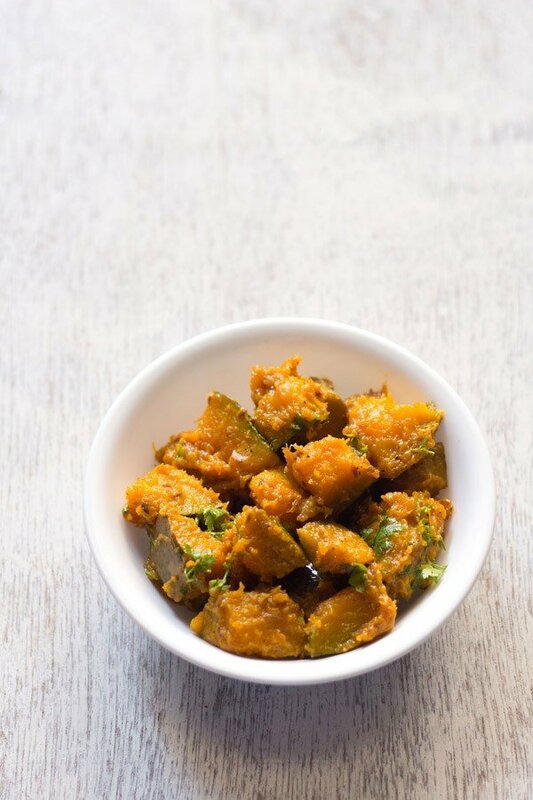 apart from this dish, you can also make kaddu ki sabzi or kaddu ka halwa for fasting. 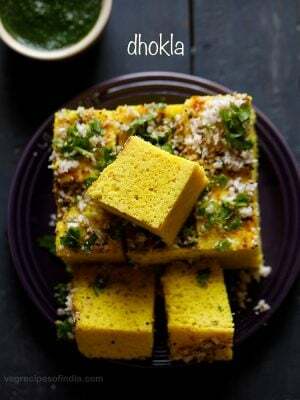 you can also check this collection of navratri fasting recipes. rinse, peel and chop the pumpkin. heat oil in a pan. 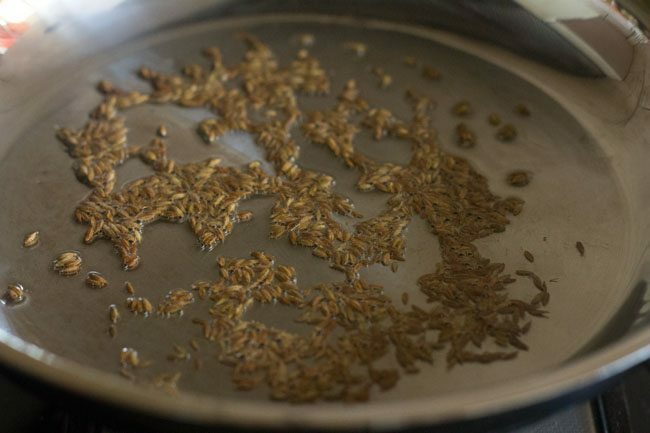 crackle the cumin seeds first. add the pumpkin, sugar and salt. 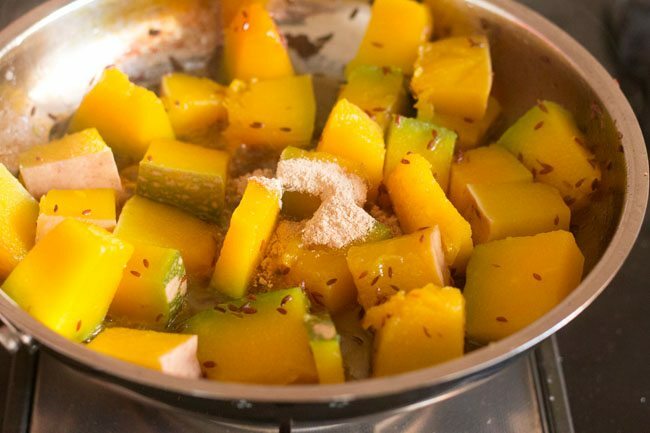 stir and cover the pan and simmer the pumpkin pieces till they are softened and cooked well. 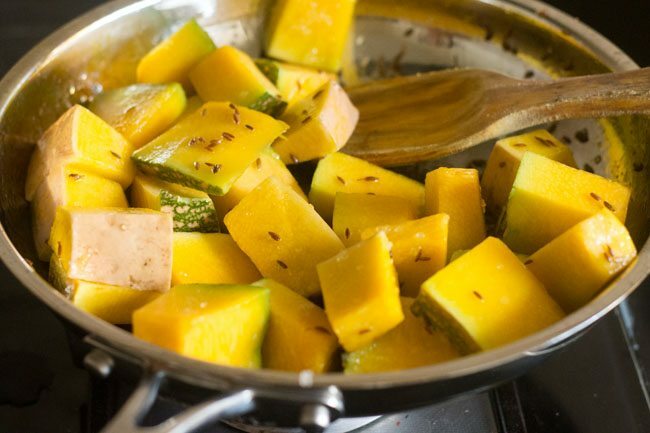 there is no need to add water as the pumpkin will get cooked by its own juices. in case the water dries up, then add about 2-3 tablespoon water and cook the pumpkin. keep on checking at intervals and if the water continues to dry, then add a few tbsp water again. the pumpkin should not get mushy. 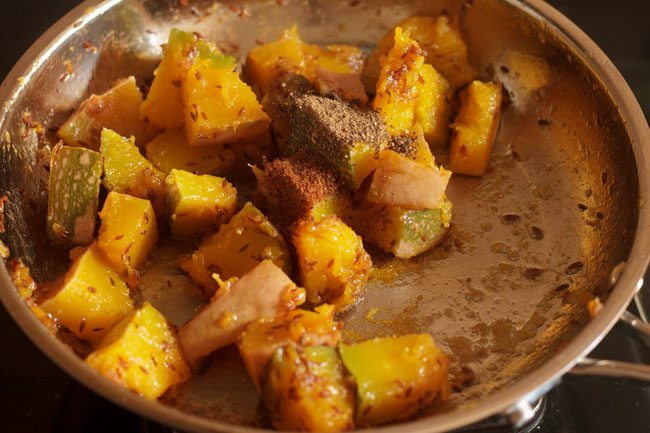 once the pumpkin is cooked well then add the dry mango powder and simmer for a minute. lastly season with roasted cumin powder and black pepper powder. 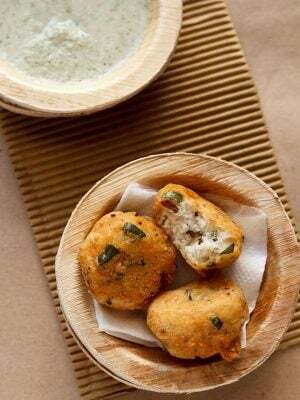 garnish with coriander leaves and serve the khatta meetha kaddu with kuttu ki roti, amaranth pooris or singhare ki poori. if adding tamarind pulp, then just 1 to 2 tsp or as required. 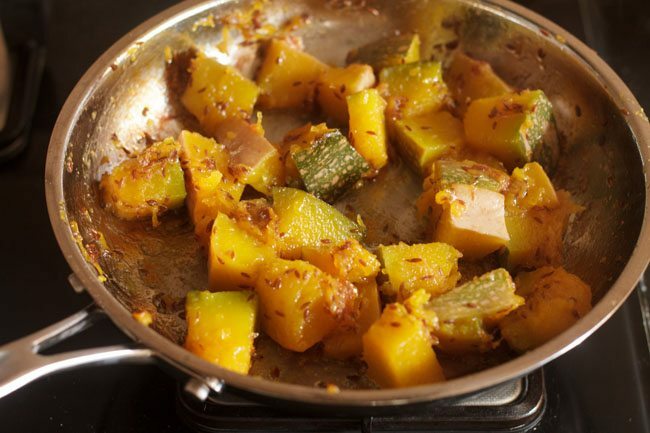 once the pumpkin has cooked, add the tamarind pulp and simmer for a few minutes till the raw aroma of the tamarind goes away. the tamarind also has to be cooked. 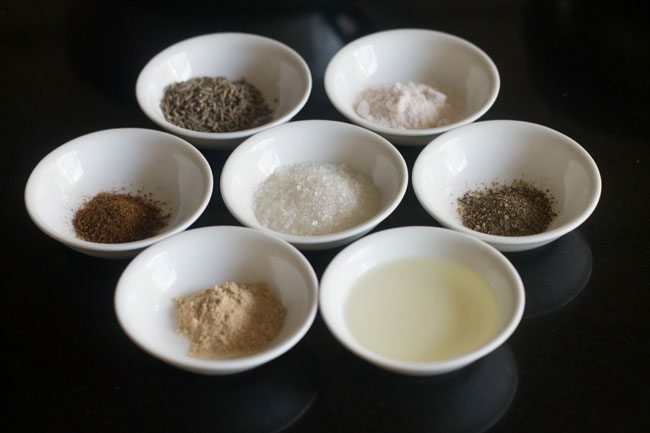 2. measure and keep all the ingredients ready for making khatta meetha kaddu. 3. in a pan heat 1 tablespoon peanut oil (moongphali ka tel). 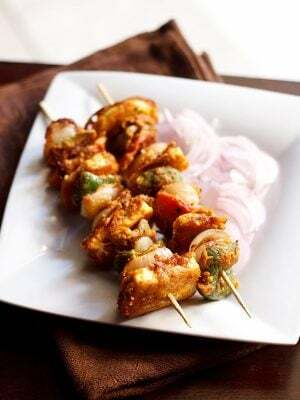 keep the flame to a low and then add 1 teaspoon cumin seeds (jeera). let them crackle. 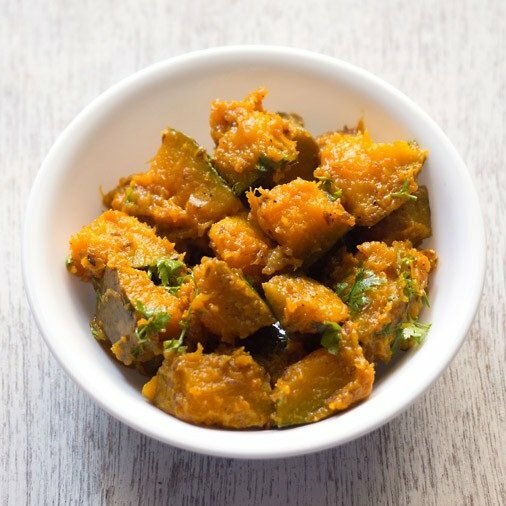 4. then add the 2 cups chopped pumpkin (kaddu). 5. next add 1 to 2 teaspoon sugar (or as required). also add sendha namak (rock salt) as required. 7. cover the pan and simmer on a low flame till the pumpkin pieces are softened and cooked well. there is no need to add water as the pumpkin will get cooked by its own juices. 8. do check in between and stir. 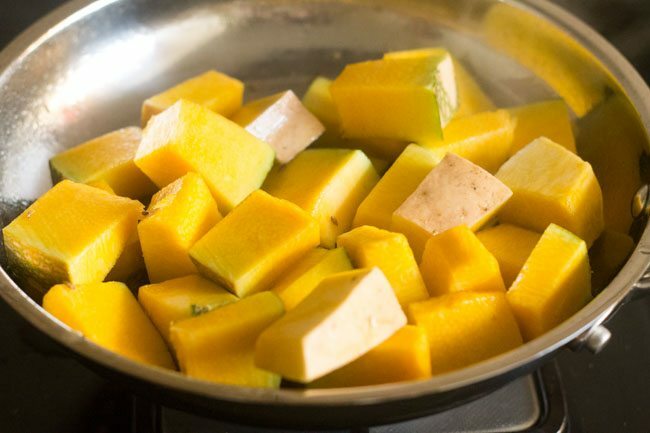 in case the water dries up and pumpkin start sticking to the pan, then add about 2 to 3 tablespoon water and cook the pumpkin. 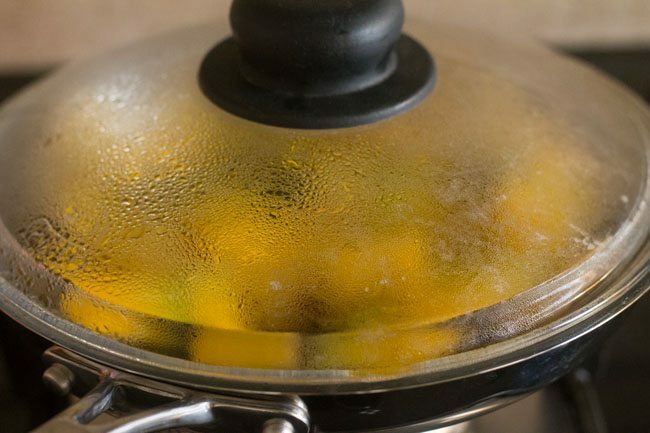 9. keep on checking at intervals and if the water continues to dry, then add a few tablespoons water again. the pumpkin should be cooked well but not get mushy. 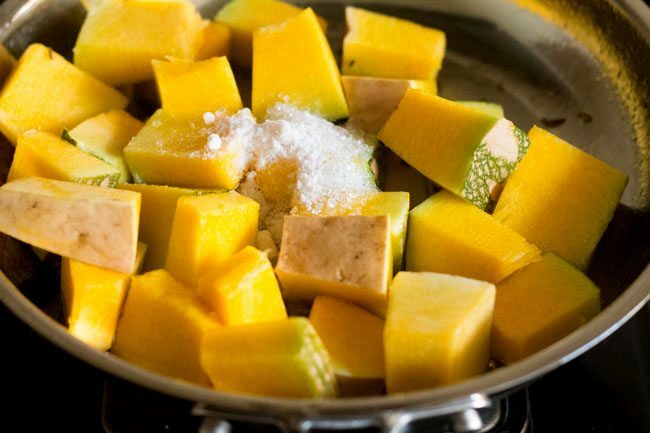 10. once the pumpkin has softened and cooked well, then add ½ teaspoon mango powder (amchur) or as required. 11. stir well and simmer for a minute. 12. lastly add ¼ teaspoon roasted cumin powder (bhuna jeera powder) and ¼ teaspoon black pepper powder (kali mirch powder). 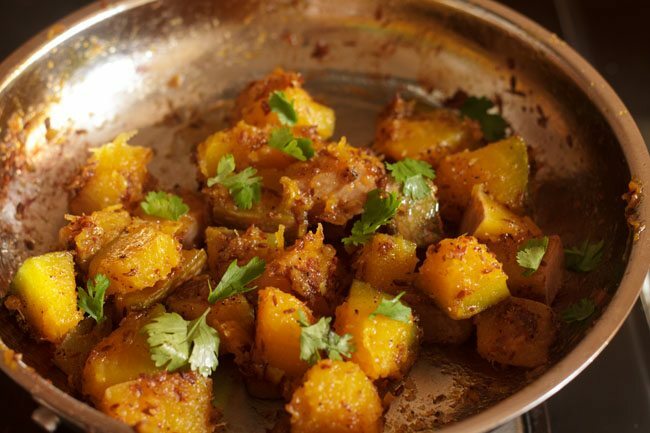 14. garnish khatta meetha kaddu sabzi with coriander leaves (dhania patta). 15. serve khatta meetha kaddu with kuttu ki roti or rajgira poori or singhare ki poori or rajgira roti or kuttu ki poori. 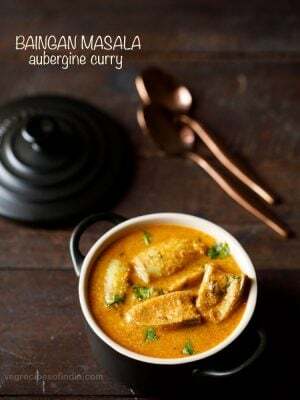 I tried out this recipe and it is just wonderful. My kid just loved it and now she asked me to make it more often. I am regular follower of your recipes and my family and friends just loved whatever I make. Your recipes are so simple to make and taste so awesome. Thank you. Please keep on sharing more wonderful recipes. Best of luck. Welcome Tina. Glad to know this. Thanks for your best wishes and positive feedback on recipes. I use lemons intead of tamarind pulp but I will try with amchur also. If we substitute jaggery with sugar, what would be the quantity? ayesha, you can add 1 teaspoon jaggery. if you feel the sweetness is less or there is no balance in the dish, then you can add 1/2 to 1 teaspoon more. all the three ingredients lemon, tamarind and amchur powder give a different taste. do try with amchur powder also. 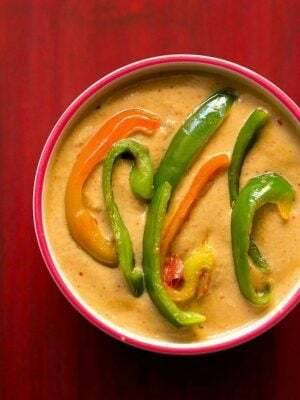 Plzzzz try dis with peanut butter & fresh grated coconut…. sure manish and thankyou for your positive words and suggestions. hi jaya, niger seeds have a fragrant smell and are not bitter in taste. so the seeds that you got are not niger seeds. dry chutneys are made both in maharashtra and karnataka from niger seeds. i think the seeds are kala jeera. not shah jeera. kala jeera is different. what you have is black cumin and its bitter in taste. 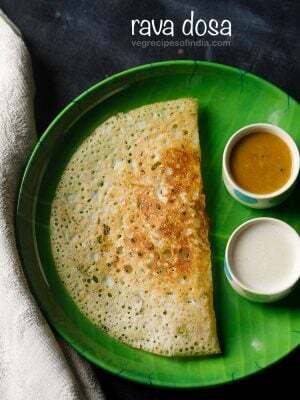 ur recipes are a big hit at home always… loved this totally and my hubby asked me to repeat it.. simple n humble..
thanks sashiya for sharing positive feedback on recipes. Hi ! Can you please tell me why you chose peanut oil specifically for this recipe? Does it make a difference to the taste if I use any other oil, like mustard oil? Thanks! with peanut oil, the taste is a bit different. you can use any oil like sunflower oil or rice bran oil. if you mustard oil, then the taste will be very different as mustard oil will add its own pungency and sharp taste.